When we bring a companion animal into our lives, underneath the happiness we subconsciously know that the day will come when we must part ways. Somehow, someday, all of us will need to find a way to cope with that devastating loss. This is why books like “Just One More Day: A Dog Lovers Guide to Quality of Life and Healing from Pet Loss” are must-read material for every animal lover, and need to be read long before the time comes to refer to them. Yet it’s odd that we don’t. For example, when author Geoffrey Bain proudly received the first editions of his book,“Just One More Day” he hit the ground running and visited boutique pet supply shops to inquire about stocking it. But the pet store owners weren’t as excited about the book as he was. They told him that putting a pet loss guide in their store would be “too depressing” for customers! The reality is, we can deny it all we want when times are good, but all of us will travel this road someday. Thus, one of the best things we can do for ourselves and our families is to know what to expect when we cope with the last bittersweet months with our best friends. Bain’s book is one of the most comprehensive guides to preparing for the inevitable. Each section of Just One More Day, from “How Do I Know When It’s Time?” to “Euthanasia and the Final Farewell” is filled with heartwarming, real-life essays written from pet parents and animal health experts who bravely share their experiences in order to reach out and help pet parents learn, prepare and heal from such great loss. Part of the inherent contract we make with our animals is that we will take care of them and they will predecase us. Once I experienced the loss of my pets, I realized I could survive it. As painful as it was, I knew I could endure it again. That freedom in knowing releases me to welcome new pets and receive all they joy their new lives bring. Smith offers hope to those of you whose grief is lingering; Death is not the end. It is the change from one realm and form of life to another.” — Katie Boland, When an Animal Loved One Dies. Some essays will make you smile, others will bring tears to your eyes, but all of them will reassure you that when you are mourning the loss of your companion animal, you aren’t alone in your feelings of devastating loss. Don’t wait until you are grieving; read “Just One More Day” now, then put it away somewhere, for some day. . .
Geoffrey Bain created this book in honor of his beloved dog Abby, who was diagnosed with osteosarcoma in 2009. Abby wasn’t a Tripawd candidate so instead, she received palliative care, and a loving goodbye from Bain who later wrote the book as a coping mechanism for the tremendous grief he was trying to process. “Everyone grieves differently, for different times, in different ways. There is no normal in grieving. 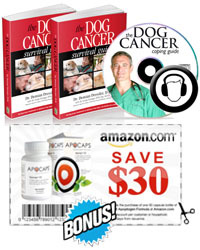 We met Mr. Bain while attending the Blog Paws 2012 conference, and when we told him how many of our members are in the midst of coping with canine cancer, he graciously gave us a free copy to give away to our Tripawds community. Would you like to win a copy of this powerful book? All entries must be received by July 12 at midnight, Pacific time. One winner will be selected at random on Sunday July 15. Sunny: never seen such a happy dog! Sly: not allowed on the furniture, but ever time he knows I’m not looking there he is! I lost my girl Chrtsy this February to osteosarcoma also, she luckily was eligible to become a tripawd which bought us 1.5 extra years together, but at 10, she was too young to lose. She was a rescue and I only had her for 7 years. She was “MY WHOLE HEART”. Those are 1 set of 3 words that I would use to describe her. I still cant get over the fact that she is gone forever………. My girl passed away in May….worst day of my life….3 words can hardly describe what i felt/feel for her….My Heart Dog or My Whole Life……sweetest girl ever! Hunter……our special chocolate lab Tripawd, is…. He is so Loving to every person and animal who enters his life. It is a sad thing that our pets (furry children) don’t live as long as we do. When God decides it is Hunter’s time to go to the Rainbow Bridge, we will be so sad to lose him, but we will have so many wonderful moments and memories to cherish forever. Well whadda ya know, according to our list at Random.org, the winner is….Kathleen! But I tell ya what…I have my own separate copy of this book. If I passed it on to the next person on the list (Maggie), would everyone be willing to pass it along to the next when they were done with it?